Are Michigan's political maps fair? President Trump won Michigan by the narrowest of margins in last November’s election – receiving just over 10,000 more votes than Democrat Hillary Clinton out of 4.8 million votes cast. But his fellow Republicans swept the state’s congressional districts, capturing nine of 14 seats statewide. Here’s a look at the results of 2016 congressional races. Click a district to see the results or type in your address or ZIP Code to see how the results of your district. The Michigan Senate is the most imbalanced of all legislative bodies in Michigan, according to “efficiency gap” methodology. In 2014, Republicans won 27 seats compared to 11 for Democrats. The GOP typically won their races by tighter margins, while the Dems captured safe seats in blowouts. Click a district to see the results or type in your address or ZIP Code to see how the results of your district. Jan. 8, 2019: Gerrymandering is dying in Michigan. Of old age. No joke. Last year, Michigan Democrats won more overall votes for state House than Republicans. It was by a whisper, about half of one percentage point. But Democrats got walloped in the race that counts, as the GOP swept 63 of 110 seats. Blame a nerdy term called “the efficiency gap.” Some political observers say it explains why Michigan Republicans continue to have such a high batting average in recent state and congressional elections, even though state voters typically cast overall ballots for both parties in roughly equal measure. The term is at the heart of a Wisconsin redistricting case on appeal to the U.S. Supreme Court that elections experts say could be a game-changer. Put simply, the efficiency gap measures the political edge gained when one party draws legislative districts to its benefit. It’s a new way to calculate the old political art of gerrymandering. The efficiency gap claims to show how many votes are “wasted” when districts are drawn to “pack” one party’s voters into as few seats as possible and “crack” them by spreading supporters into multiple districts and diluting their power. In Wisconsin, a federal court panel found that state Assembly districts drawn by the Republican Legislature were so tilted its way they were unconstitutional. The case is being watched closely in Michigan, which some observers say has even more skewed districts. Former Michigan Democratic Party chair Mark Brewer is readying a federal lawsuit to challenge the state’s districts that likely would use similar arguments to the Wisconsin case. “(Districts are) not random chance,” said Grand Valley State University political science professor Erika King. “It’s very carefully done. It’s not unique to Michigan or to one malign political party. If you are the party in power, it’s what you do." Ink blot or political district? 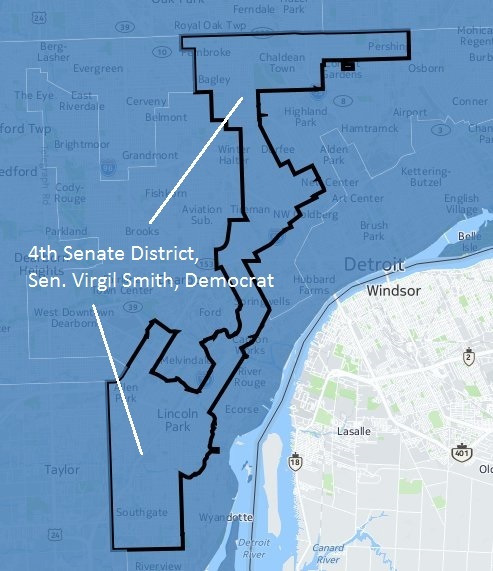 The fourth senate district stretches from Downriver in southern Wayne County, across Detroit to its northern border with Warren. She noted the 2014 race for state Senate in Michigan, where Republicans barely topped Democrats in total votes but claimed 27 out of 38 seats. In 2016, Republicans beat Democrats by just 1 percent in total votes for Congress yet won nine out 14 seats. Until now, the U.S. Supreme Court has been reluctant to wade into redistricting cases for lack of an objective standard to prove partisan intent and provable harm to voters. Political districts are redrawn every 10 years following the census to account for shifts in population and ensure districts have roughly the same number of voters. Under the federal Voting Rights Act of 1965, districts are also supposed to give minority voting blocs a fair chance at representation. In the case of both Michigan and Wisconsin, both states redrew districts in 2011 under Republican legislative control. The Wisconsin federal panel was swayed by a simple formula devised by a law professor and a political scientist that measured and compared so-called “wasted” votes. 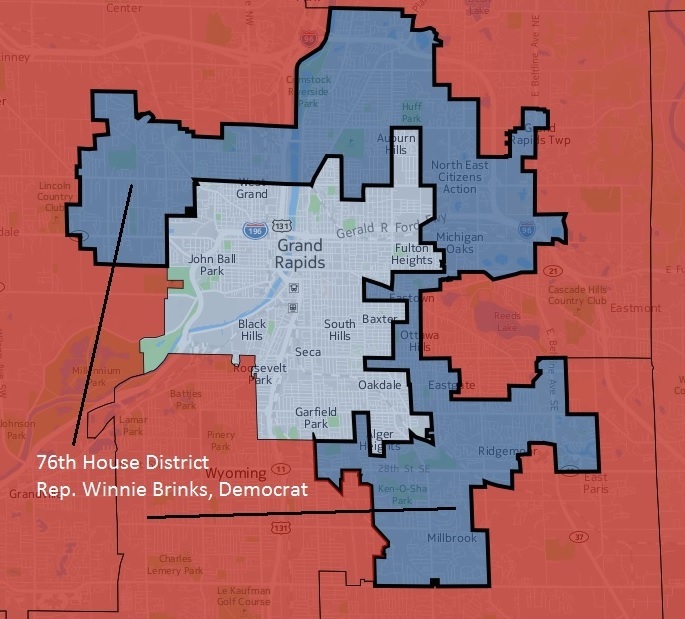 Wrap around: Democrat Winnie Brinks' state house district wraps around Grand Rapids and along with David LaGrand gives the area two solidly Democratic districts. Neighboring districts are solidly Republican. Any vote cast for a losing candidate is counted as “wasted,” as are votes for a winning candidate beyond the number needed to win. In 2012 – the first election after redistricting – the formula calculated the gap to be a 13 percent advantage for Wisconsin Republicans. Plaintiffs in the case argued that anything above 7 percent should be deemed unconstitutional. In 2012, Democrats claimed 51 percent of the vote for Wisconsin state Assembly to 49 percent for Republicans. The GOP, though, won 60 of 99 seats. The ruling from the federal court stated: “Although Wisconsin’s natural political geography plays some role in the apportionment process, it simply does not explain adequately the sizable disparate effect” on voting results that followed reapportionment. On Feb. 24, Wisconsin’s attorney general appealed the panel’s finding to the U.S. Supreme Court, asking it to reinstate the GOP-drawn legislative boundaries. The Republican attorney general, Brad Schimel, argued that Democrats are geographically clustered in higher numbers in cities like Madison and Milwaukee, while comprising the minority in outlying districts. But if there’s a case in Wisconsin for unfair partisanship in redistricting, Michigan’s election results by this metric look to be just about as partisan – or worse. Under the same formula used in the Wisconsin case, a Bridge Magazine analysis found the “efficiency gap” favoring Republicans to be 10.1 percent in the 2016 state House races, 15.5 percent in the 2016 races for Congress and 22.8 percent in the 2014 races for state Senate. Nicholas Stephanopoulos, the University of Chicago law professor who helped develop the mathematical voting standard used in the Wisconsin case, said Michigan's efficiency gap puts it in rare company. He said research for the lawsuit into other state legislative races in the past decade found just 1 or 2 percent of those races with gaps above 20 percent. “It’s quite clear that Michigan is just as extreme an example as Wisconsin,” he said. Mark Brewer, former Michigan Democratic Party chair, is readying a lawsuit of the state’s political districting that alleges they illegally favor Republicans. Brewer, the former state Democratic Party chair, said he has been in touch with attorneys for the Wisconsin case for two years – and the Michigan lawsuit will use the same vote analysis methodology central to the case in that state. “We believe the evidence in Michigan is just as good, if not better,” said Brewer, a Southfield attorney, who added that the state Democratic Party is not affiliated with his pending lawsuit. And while Brewer preps his case, a grassroots group is organizing (see accompanying story) to put a constitutional amendment on the 2018 ballot that would take redistricting out of the hands of politicians of either party. 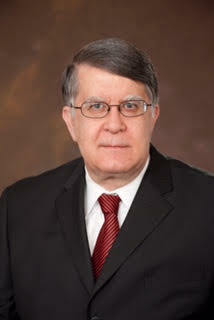 Republican consultant Robert LaBrant said Michigan’s 2011 redistricting map meets standards for fairness under what are known as the Apol Standards, which have governed the state’s redistricting process since 1982. Ordered by the Michigan Supreme Court, the standards state that districts must be compact and contiguous, and in the case of legislative districts, must preserve county lines when possible. “It’s as fair as any redistricting can be when you have the Legislature draw the map,” LaBrant said. LaBrant argued the GOP's recent success in state House and Senate races is the product of natural “political geography” – more Democrats are clustered in urban areas like Detroit, Lansing and Grand Rapids. GOP political consultant Robert LaBrant attributes the sizable Republican advantage in Michigan legislative and congressional seats to the concentration of Democratic voters in large urban areas. “As long as you are going to draw lines based on political subdivisions where you try to keep cities and townships intact, Democrats kind of self-packed, if you want to use the terms ‘packing’ and ‘cracking,’” LaBrant said. As for the potential impact of the Wisconsin case, LaBrant asserted that it's “by no means a slam dunk” the Supreme Court would uphold the lower court ruling. Under procedural rules governing the Wisconsin case, decisions by federal district court panels are appealed directly to the U.S. Supreme Court, although the court is not obligated to hear the case. The court is expected to announce by this summer whether it will grant a hearing. If it reaches the high court, judicial analysts say the case could hinge on Justice Anthony Kennedy – who has called in the past for an objective way to prove unconstitutional gerrymandering. In a 5-3 2004 Supreme Court decision that upheld a Pennsylvania federal district court ruling that gerrymandering was not unconstitutional, Kennedy said the court lacked a “manageable standard” by which it could prove its impact unconstitutionally burdened voters. “If workable standards do emerge to measure these burdens, however, courts should be prepared to order relief,” he stated. Perhaps complicating things, the Supreme Court is expected to rule this summer on a pair of cases dealing with racial gerrymandering. While the Voting Rights Act allows for some consideration of race to assure minority representation, the court is expected to weigh arguments that districts in Virginia and North Carolina were deliberately packed with minority voters to dilute their impact. If the Supreme Court does uphold the Wisconsin ruling, that could have enormous impact for redistricting in 2021 – given that Republicans currently control both legislative chambers in 32 states. Big win, small losses: In Kalamazoo, Democrat Jon Hoadley won the 60th house district with nearly 70 percent of the vote. But two neighboring Republicans won far more narrowly. “It has potential to change maps across the country,” said Barry C. Burden, director of the Elections Research Center at the University of Wisconsin-Madison. 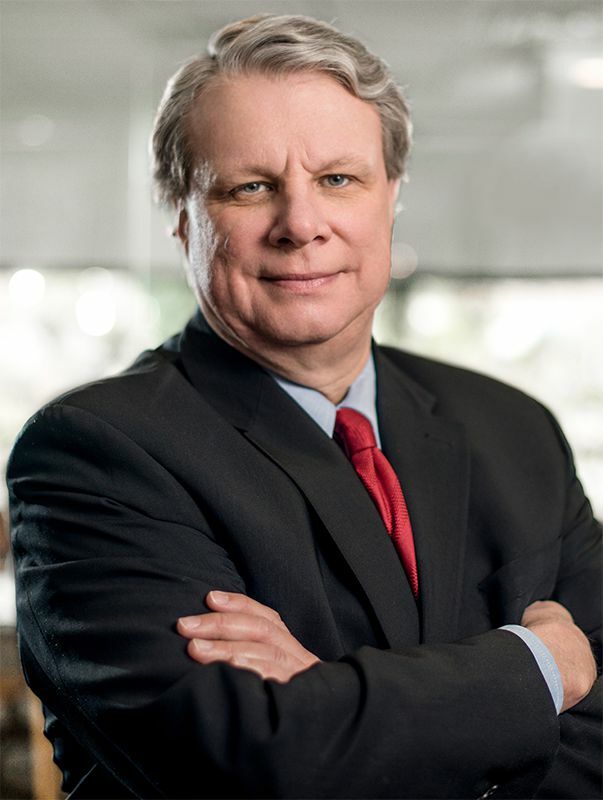 In cases back to the mid-1980s, Burden said, Justice Kennedy has indicated he’s searching for a clear threshold to decide when redistricting swayed too far into partisanship. Burden said he believes the Wisconsin case may give Kennedy that line. If he finds merit in that standard, court watchers say, that could lead to a five-vote majority if he joins the court’s four liberal judges. “It’s highly intuitive. It’s easy to comprehend. It doesn’t require any high-level statistics. Anyone can count it if they have a calculator and a little bit of information,” Burden said. If the Supreme Court declines to hear the case, the lower court ruling would stand - and Wisconsin presumably would have redrawn Assembly boundaries for the 2018 elections. But that could also undercut the chance of success of any court challenge to Michigan’s legislative maps. Thanks. We fixed it yesterday after you pointed it out. Keen eye, Matt! He's simply wrong. The current situation is entirely the result of manipulation by one party for it's benefit (and the Dems do it in Illinois...so let's be clear here). But it's not good for democracy in any way, shape or form. So let's fix it. Lots of ways to do that, from simply letting the Legislative Service Bureau do it without any access to voter information (Iowa plan), to saying whoever turns in the plan that meets the Apol standards BUT ALSO CREATES THE LARGEST NUMBER OF COMPETITIVE SEATS, i.e., those closest to a 50-50 tossup based on past voting history must be adopted. I lean toward Iowa...but clearly, what he have now is based on power and, as noted, Machiavellian plotting. There are issues with the median mean measurement method as outlined in this article. It sometimes shows adverse conditions when they aren't present and misses it at other times. This could lead to a decision from the USSC that could set back the fight against partisan gerrymandering for the foreseeable future. Very sad to see this. It's 'party over country / democracy', pure and simple. Let's let our party win even if it's unfair, unjust, and makes democracy a farce. And our 'new' Supreme Court will choose party again over democracy. Bottom Line is that cities like Detroit, Southfield and Bay City need more Republican Representation. With all the issues being faced in Lansing I struggle to see how gerrymandering elevates itself to one of the more important issues. This whole activity seems like another effort to undermine our representative form of government. There seems to be two questions to answer; 1) do we trust the voters? 2) is it better to trust to an elite team of programmers that are unaccountable to the voters or to trust to officials elected by the voters? It could have been informative to have an overlay of state wide voting to see whether gerrymander affected voting. If we are to believe voters only vote with the Party of their district, I wonder why all state officials voted for across district lines are Republicans as is the legislative majority in spite of gerrymandering. Should we believe that an elite team defining the districts would change the voting, and if so why would we relinquish such power to people accountable to voters? Recalling that there was a time when the Democrats were doing the redistricting and they were actively gerrymandering districts. If gerrymandering were/is such an impactful tool for the Party in power it would seem the Democrats should still be in the majority and yet not so. If gerrymandering is such a bad practice I wonder why the Democrats didn’t change it when they had the power, why it took them until they weren’t the majority to discover this problem. I believe that voters make their choices despite their district Party. I vote based on what the candidate says, has done, and what that suggests they will do. I believe voters take a similar approach in making their choices, and it seems the most recent election verifies that voter independence. That leads me to feel that the gerrymandering issue is not a measurable factor to our election process. Agreed. On a more technical note, however, what does the 'gerrymandering' tag have anything to do with the political district slice-up of Michigan? Was this an honest editing error or a bait-and-switch tactic? Would appreciate some clarification. The use of the term 'gerrymandering' is a means of discrediting the legitamacy of any and every district, no matter which Party carries the majority. When someone invokes 'gerrymandering' they are implying since a Party member was involved then there must be a partisan bias and all that they do is tainted. If they could come up with a comparable word that engendered that same prejudice when it comes to legislative votes they would use that. Currently the closes they have come is 'partisan', but that only means that a person is on one side or the other of an issue/solution/legislation. It doesn't evoke the feeling of self interest that 'gerrymandering' does. 2: prior rounds of gerrymandering were done manually. Still unfair, but also not very effective. Using GIS to draw up districts is a different matter. It's the difference between a musket and a machine gun. Our political rancor has gotten so bad that there is a tendency to demonize each other as if they are bad people wanting to represent us. State politics have shaped the federal landscape as well. This has led to such extremist politics that it is difficult to see how anyone is represented except special interests. We truly need bipartisan representing to promote some compromise. Neither side may get what they want but we might get back to democracy. Thanks for this very well written in depth report on a very important issue. As an Ann Arborite Democrat I feel like a disenfranchised voter, not to take away anything from minorities who are also disenfranchised as found by the courts in many states. Clearly this is unfair and needs to be changed to uphold the rights of our voters and maintain a viable and stable democracy. Even the GOP need a state to call home that is not in a state of critical instability, which will come if changes are not made. When we see voting results for Michigan we need to make it clear that just in Detroit, overwhelming Democratic, close to 80,000 votes were not counted for president where Trump ‘won’ the state just about 11,000 votes. In this day and age it is outrageous we have such Gerrymandered districts and a voting system that is so dysfunctional toward Democrats and minorities. Voters should pick the politicians not the politicians pick the voters, as is now the case in many states including Michigan. The Ann Arbor Federal House district is sited often as one of the worst in the country. Vince- You make the point for the tradition of Gerrymandering and our country's constitution for the Electoral College. Why should Detroit or Ann Arbor dictate State Policy? Equally so, the Electoral College prevents dense areas like NYC or LA from solely determining a Presidential Outcome. As for your statement that votes weren't counted - one must cast the vote properly for it to count. My suggestion to you is to move to a Republican community to share your philosophy with others as they may learn from you and you many learn from them. The result in one area had ONE home in a certain ward in a separate congressional district than ALL others in that ward. Thus: That ward needed to create enough ballots (one, two, maybe three) for the voting age people living in that home. Bingo. By county, Michigan is a Republican Party supporting state. Michigan is a blue, liberal state and has been since 1992. We do not tolerate the hate, ignorance, racism, sexism and archaic policy decisions stemming from the historic failure of an ideology that is conservatism. If you want a red state, move south. We're staying liberal here, and will continue to fight every damaging conservative policy tooth-and-nail at any and every cost. County level voting stats are irrelevant without factoring in population density. When you do, the majority of people in the state vote liberal, not conservative. This is true for the nation as a whole, as America is a liberal nation- the very thing that has led to its success as a nation all along. Only now, with the hijacking of the nation by an illegitimate, corrupt and dangerously unqualified administration pushing us into forced conservative policies is the nation dying, loathed by the world, hated by its allies, and suffering economically and morally as rights are being stripped and lives are being lost all over conservative greed. Conservatism is dying a last gasp, and its none too soon. Thankfully the youth are smart, hopeful, diverse, and inclusive and overwhelmingly identify as liberal, and the future can once again be bright and the nation can once again be worthy of respect and be a global leader, unlike now. nominated a pair of ex-Governors, Soapy Williams and John Swainson, to challenge incumbent GOP Justices - Dethmers and Kelly. When there was no agreed upon plan, the whole thing went to the MI Supreme Court where Justices Swainson and Williams voted with their fellow Democratic nominees for the Democratic plan (surprise, surprise). When the same scenario occurred after the next two censuses, the 1970 plan was subsequently tweaked after the censuses in 1980 and 1990. The last two censuses were GOP gerrymanders and that seems to, somehow, be worse than the earlier ones. They're not. They're just as bad, or good, depending on your viewpoint. If you want to change this, the first thing that would have to go is the majority/minority districts. These are little more than excuses to segregate non-white voters into electoral bantustans. End that, and we can begin to make the districts more sensible. You can look at the population per ZIP code and begin creating or drawing districts in some semblance of geographical sense. The 2010 census set the people per district at about 711,000 - give or take. With population growth, new districts should run 720,000 to 730,000, give or take. To create a "Detroit" district, you would take Detroit with roughly 620,000 people and add Highland Park, Hamtramck, the Grosse Pointes and Harper Woods. That should get you to roughly 725,000 - give or take. Macomb County would be its own district minus its upper tier of townships (maybe) depending on census data. Oakland County would be two districts, either east/west or north/south. East/west can protect the incumbents while north/south won't. Monroe, Lenawee, Washtenaw and Livingston would be another district and so on. Things get more interesting if we lose a congressional district. But the real fun is in drawing up state house and senate seats as those numbers remain constant 110 and 38 respectively. Again, using the ZIP code can help, but the costs to vested groups will have an absolute fit. But hey, then it will make politics truly newsworthy and force the local TV stations to cover politics more. It is unfortunate that your analysis does not include any results for what the outcome would have been based on maps that you or others think are a better way to draw voting districts. I would think you can draw a map first based on keeping Counties together, then when not possible cities and then when not possible neighborhoods. The fact that those likely to vote for democrats live in high density with each other would likely result in similar results, but unless someone runs the numbers there is no way to know for sure. TRAITORS TO THE UNITED STATES OF AMERICA have corrupted our democracy by the most radical & immoral tactics - all calculated and executed by the greediest most immoral families in the country who have purchased a political party to enrich themselves and inflict suffering on the people who make the country prosper with their daily hard work. Michigan has been duped, neglected and downgraded in every way. I don't expect we will ever recover from this treachery. "Any vote cast for a losing candidate is counted as “wasted,” as are votes for a winning candidate beyond the number needed to win." I think there may be an error here. Any election would generate at no less than 50% wasted votes. Of all the U.S. states, none or very few have a shape and mix of population to match what Michigan presents! Why? Blame the glaciers that reworked the inland sea long before we the people existed anywhere! Combine it with populations natural tendencies to follow patterns that are somewhat accidental and bingo you have a chance for gerrymandering when some political currents add to the confusion. Adding a new vehicle of 13 persons somehow picked in a meaningful way is about as easy as predicting hurricanes. It may sound good to talk about changing its methods of adjusting for population every 10 years to achieve a mythical goal of equal proportionate representation; but, its not possible to even guess as what the results would produce. You could not guess what a computer model can do much better to get the numbers to also work! What we have is about as good as it can get! We may have to consider four or five parties too! The FACT of the matter is that Democrats cram themselves into cities and control nearly all of the city governments. They are angry that they also don't control the state government as a consequence of their own decisions to live in cities. This is typical of Democrats, they want the benefit of their own decisions but want a safety net in case things don't work out so they are willing to give up much of their benefit when things go right to ensure they have safety when things go wrong. Republicans, on the other hand, want to reap the full reward of when things go right and are willing to face the consequences of bad decisions alone. This is the real difference and you see it again and again. Should we have competitive districts? In the state house and senate, absolutely. In the Federal House? NO!!! We would loose seniority at the federal level, we loose power and we take home less federal funding. How should the state districts be drawn? Imagine a daisy, image the petal of the flower coming out of the center. Each district would have to have the petal point be in a city and the petal's wide end expanding into the rural areas in order to represent an equal number of democrats and republicans as well as representing rural vs urban interests.